I am excited to share this with you today! I have been using this homemade laundry detergent since November, just trying it out before I shared it with you. And since I LOVE it, it is time to finally share. This detergent is CHEAP, smells great, is fast and easy to make, and it works really well. You will need 4 ingredients (pictured above) which you can find at Walmart or pretty much any grocery store – 3 bars of Fels Naptha soap, large box of Baking Soda, large box of Super Washing Soda, and a large box of Borax. The Fels-Naptha soap will need to be grated. You can grate it by hand with a hand grater or if you have a food processor you can grate it in there. I grate mine in my food processor. 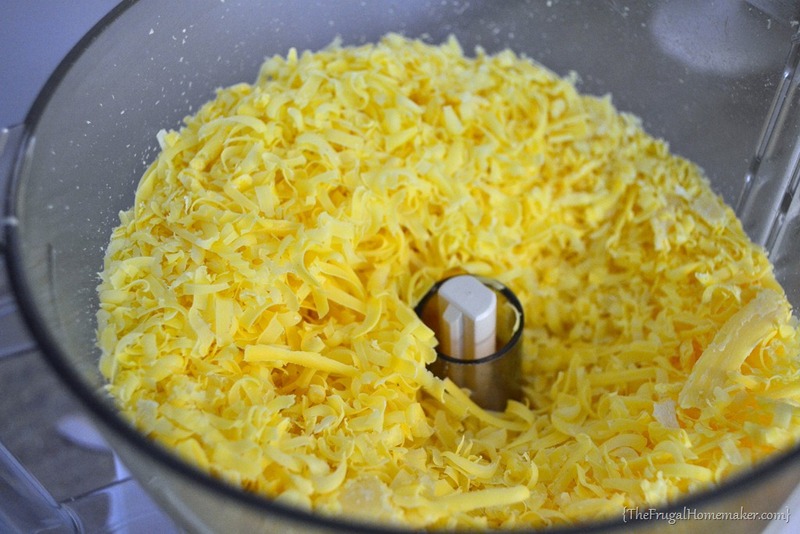 It looks just like cheese after is grated, and it smells wonderful! You can just mix up the grated Fels-Naptha with the other powders just like that but I like to blend mine up to make it finer. I just blend (again with my food processor) some of the washing soda or borax with the grated Fels-Naptha until it is much finer. Some people will add a large container of Oxy Clean powder to this recipe too. 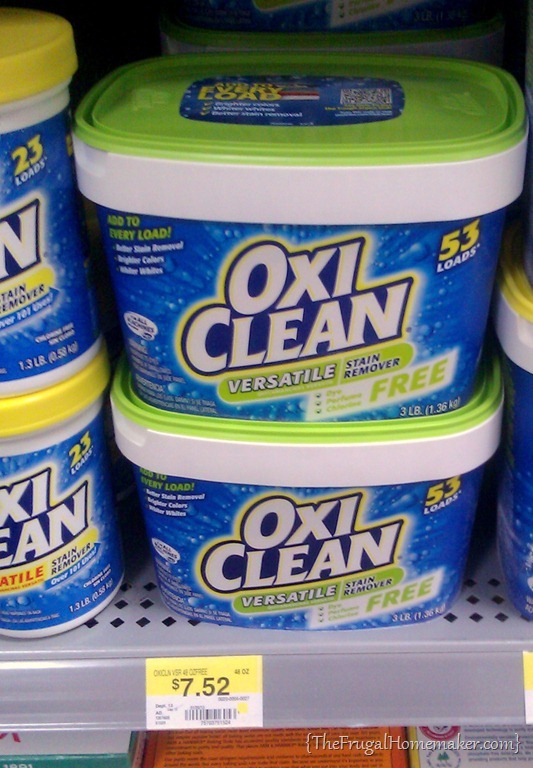 But at $7 a container, to save money, I only add oxy clean to my white loads (in place of bleach) or extra dirty loads in addition to the detergent. Now for the price breakdown – here is a picture of all the ingredients and prices at my local Wal-mart (in the laundry care aisle). Once grated and mixed together it equals 26 cups of detergent (416 tablespoons). 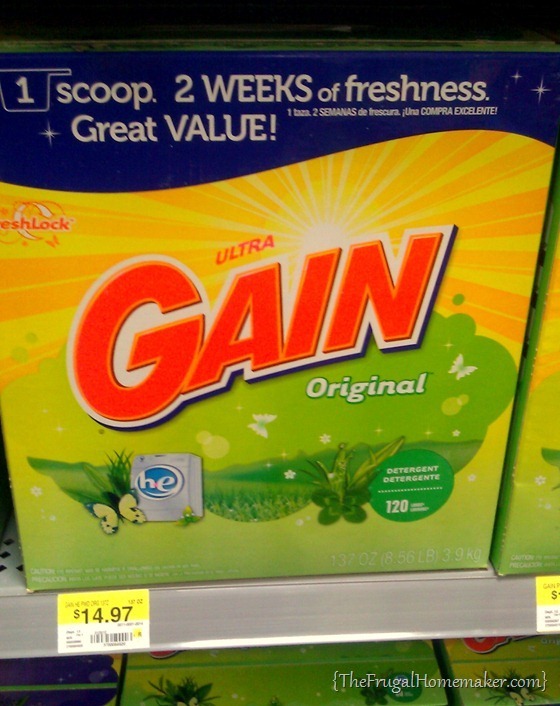 If I use 1 tablespoon per load that gives me 416 loads (2.8¢/per load, so less than 3¢ /load.) If I use 2 tablespoons, I will get 208 loads (5.6¢/per load, so less than 6¢/load.) And since I only do 2 tablespoons for extra large loads or extra dirty loads, I will get somewhere in between 208-416 loads making my cost 4¢ – 5¢ load. Even if I used 2 tablespoons per load I would get 208 loads (double the Tide above) and I would pay less than $12.00. 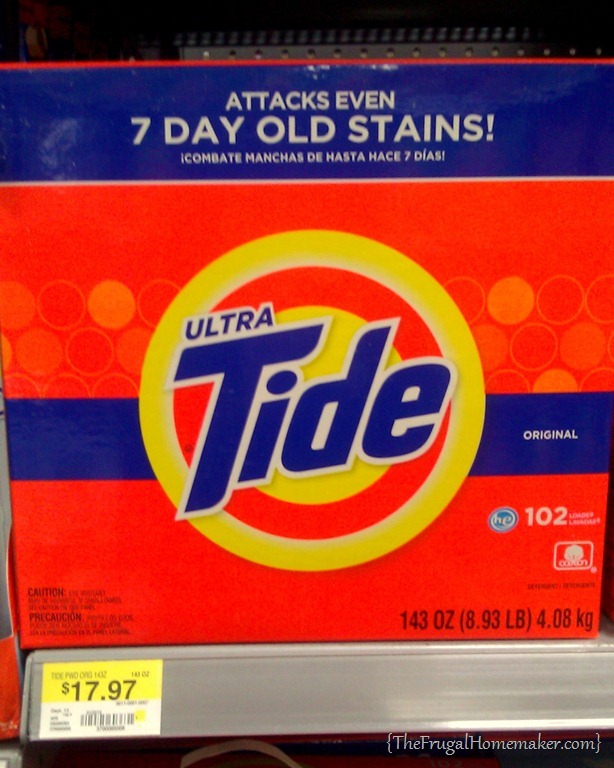 I would have to buy 2 boxes of Tide for $35.94 to get that many loads. So you can see it will save you a lot of money! One other thing about it that I love. We hang dry a lot of clothes (jeans, sweaters, shirts, etc.) to prevent fading, shrinkage, etc. And jeans especially would end up smelling ”musty” or that “left too long wet in the washing machine smell” – know what I am talking about? Because they took so long to dry, no matter if I took them right out of the washer when done, by the time they were dry they would usually smell. NO MORE! Not with this detergent! I think the baking soda really helps with that. Everything I have read has said you can use this in HE (High Efficiency) Washing Machines since this detergent does not sud much, if at all. I personally have an HE top loader washing machine and it has worked fine in mine. I do try to add the detergent to an empty machine, start the water and let it run for 10-20 seconds while I am sorting or gathering clothes, just to let it dissolve some into the water. Even with regular store bought liquid detergent, my machine instructions recommended adding the detergent at the bottom to an empty machine. There are MANY homemade laundry detergent recipes out there. This is the first one I have tried, but I encourage you to do a quick search on Pinterest or google if you want to compare or find more recipes. You can also take this basic recipe and turn it into a homemade liquid detergent. MaryEllen posted her method for doing that here. And once again, do a simple search and you will find even more ways to do that. Check out my “homemade & healthier living” board on Pinterest for some more recipes I have pinned. If you have any other questions, ask away in the comments and I will be sure to answer them and even update the post if I need to. Do you make any other cleaners or detergents? Next I want to try making dishwasher detergent – so if you have a good recipe for that, let me know. love it!!! 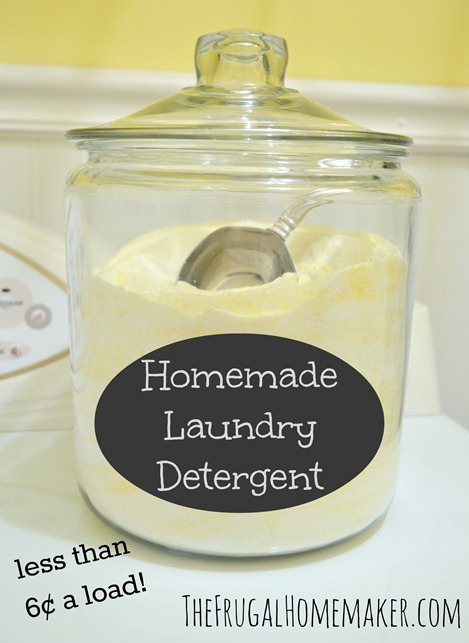 Definitely planning to try homemade laundry detergent once my supply runs out! thanks!! Great post! Will definitely be trying this. A few questions though, any tips to ensure brighter whites? Removing stains, specifically armpit stains (men)? Lol. Any tips are greatly appreciated. I do something similar to this, but my receipe is 1 bar of Ivory, 1/2 cup of Borax and 1/2 cup of washing soda. I use 1 tablespoon per load. Sometimes I multiply this receipe and end up using 6 bars of soap and 3 cups each of borax and washing soda and I dump in a container of downy unstoppables. I use this laundry soap on everything from cloth diapers, to my husbands greesy military uniforms. It works well for my son who is allergic to almost everything and we have been using it for over a year now! Thank you for adding this… we all have very sensitive skin when you said Ivory i said “that’s it!’ thank you so much form a sensitive household…. will try SOON!!!! I am surprised you use this much soap, most recipes you double the other ingredients ie: its usually 1:2 soap being one. I have been making and using this for 2 yrs and it’s great! I used to make a recipe very similar to this only in smaller batches and I loved it. But, after using for a while I noticed my whites getting dingy gray–even with using bleach. So back to store bought I went. Have you noticed this? and, does the Oxi Clean prevent this? 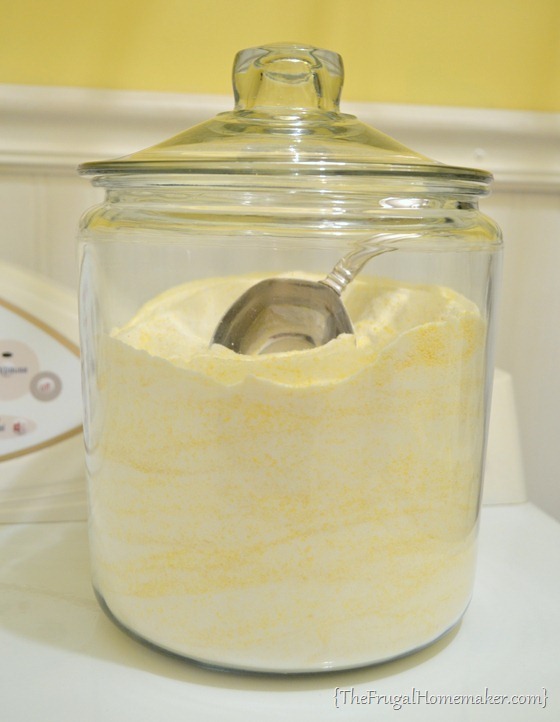 I would love to get back to making my own laundry detergent again. You are right….the smell is amazingly clean! My mother tells of when she married my step-father, his whites were very gray, too. He had been a widower for nearly 20 years. She put them in the washer with only borax, running a complete cycle in the washer. She did this three times in a row before she was satisfied with the results. The cause, she says, is of the detergent not being completely rinsed out before drying. This can also happen when using liquid fabric softener. She uses only white vinegar for fabric softener. It keeps her towels fluffy without the greasy build up of either liquid softener or dryer sheets. It’s cheaper than his solution: toss & buy new! bleach can cause whites to yellow or discolor. You can buy laundry whitener at walmart for a few dollars and add to whites and clothes look great. Just don’t add it with colors because it will bleach them. Thanks for posting this, I’m going to give it a try! I just need to find that Fels-Naptha soap – I don’t recall ever seeing that around here, hmmmm. I’ve been making and using this same recipe for a while now, but I add some essential oils to give it a nice fragrance. In the winter, I use orange and sage oils, and in the summer it’s jasmine or lavender and lemon. Yum! How many drops of oil do you use? I wash in all cold water. Will this work? The Boy Wonder and I are also wanting to know about this, especially since we wash everything in cold water. Also, for those interested – there are Pins for homemade Oxy Clean on Pinterest. I used to wash mine only in cold & it does work, but I don’t think the detergent fully dissolved. Now I use warm & haven’t noticed any undissolved detergent in my drain. I mix my powdered soap in about half a cup of warm/hot water first until no grains are left and then pour it into the dispenser of washer. It has been working great so far. Great post! I just went out to Wal Mart to get what I need 🙂 I think I will add some essential oils to it too to make it smell amazing! 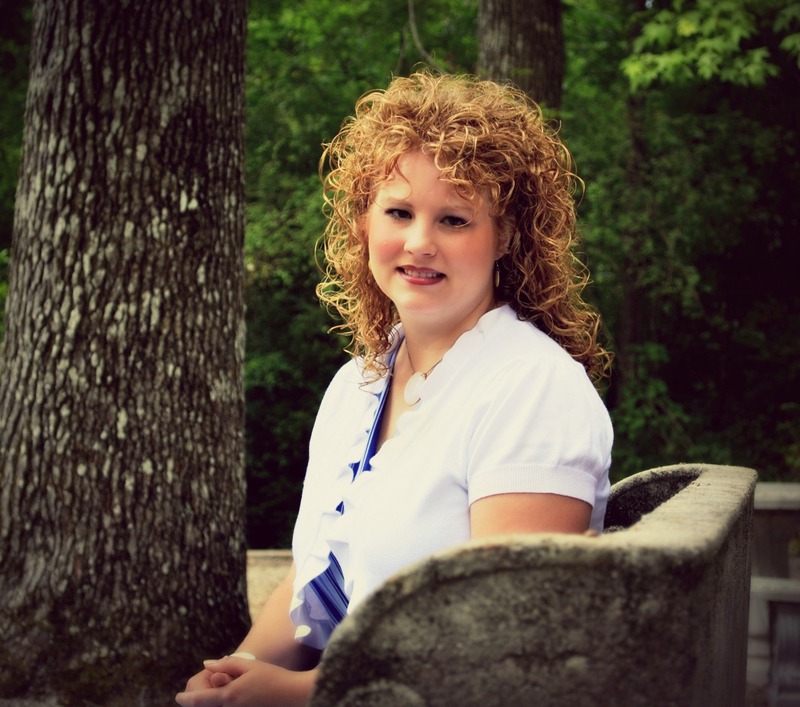 Tina@servingwithapurpose.com recently posted..Boiron Arnica Gel-Review and Giveaway! 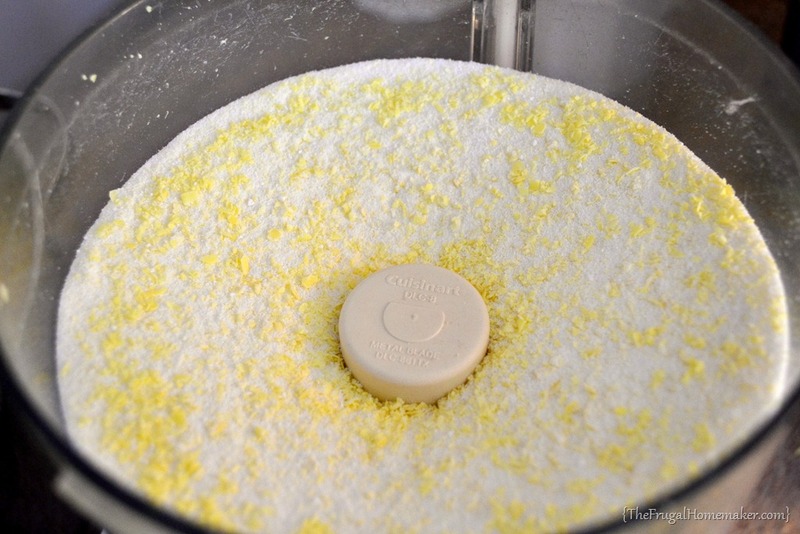 I love the idea of making my own laundry soap and I plan to do it this weekend. Thank you for your recipe, it seems easy, cheap and straight forward, and I think we can all appreciate that :). My question for you though is, would the recipe work the same if I didn’t use the Fels-Naptha soap and replaced it with another soap? I only ask because I have never heard of it ( I am from Ontario Canada) and I’m not sure we would have it here I just wanted to ask before I go out to look for the ingredients to make the laundry soap this weekend. Thank you. P.S. I’m really excited to explore the rest of your site, it’s great that you’ve taken your time to share all your tips and tricks and ideas with us all. you can use other soaps if you can’t find Fels Naptha. You can use Zote (a pink soap found at home improvement stores here in the US.) and some people even use soaps like Ivory if they have sensitive skin. I would maybe try 1/3 of the batch with whatever soap you can find and want to try – and try it out to see if you like it and it works well. then you could always make more or try another kind of soap. I am from Canada as well (Ontario), and I use the 2 pack sunlight bars and a Linda bar. I found them at No Frills. Wal-Mart has them as well. My understanding is that it just can’t be a “beauty” bar with all the extra moisturizers in it. I tried it once thinking it would smell nicer, but it didn’t work well at all. I am from Ontario as well. I use the 2 pack Sunlight bats, and a Linda bar. Got them both at No Frills. I also have been making my own detergent for almost 3 years now, and love it. I used to make the liquid type, but it was kind of time consuming. I’ve. Bee doing powdered for 2 years now & don’t plan on changing anything! I use 1 bar ivory, 1 cup borax, and 1 cup washing soda. I did find after a long while my whites turning dingy, so now when I triple the batch (which I did anyway) I add a bag of cheap generic oxipowder stuff Obey at the dollar store. It perfectly fills my ice cream bucket & last almost 2 months! Can’t beat that! For a fine final finish to the washed laundry, use a quarter cup white vinegar in lieu fabric softener in the rinse. It helps the laundry rinse out better, the dyes are set better into the fabric better so they don’t fade as fast and is a perfect natural fabric softener. It is much cheaper than commercial fabric softener as well and no, your clothes will not smell like a tossed salad. i always want to do this but i live in peru and finding ingredients can be such a pain- not just finding them but also at a decent price. sometimes i get a diy idea and then realize that i can just buy the product already done and made so much cheaper. I know you use 3 bars of the soap, but how much of the other ingredients do you use? 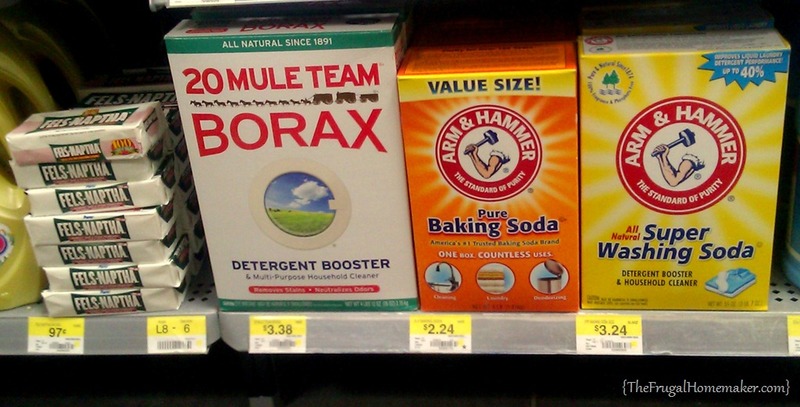 Do you think you can substitute oxy clean for borax? Borax got a very low score from ewg.org because of its harmful ingredients. does the shout work really well? would love to try that too. I am currently using a no-brand Oxy spray that seems to work ok. Does your clothes come out soft? YES, they really do! I think my towels are softer now then when I was using reg. detergent and fabric softener. I don’t use fabric softener any more now although I still am using fabric sheets in the dryer. Fabric sheets have some really nasty ingredients and also leave a greasy feel. I am highly allergic to such things so never use any commercial softening products. For softness try vinegar in the rinse cycle or if you want scent make a sachet with lavender buds. Add other essential oils you like if you want a stronger scent. Just made this laundry detergent the other day and used it for the first time today. Love it! I have acute scent sensitivities, but this soap doesn’t seem to bother me. Very unusual. I did put Oxy Clean in it, but I bought the Scent Free box. Works great!! Are you sure ONE tablespoon is really enough? I’ve heard that you can use much less than the detergent makers suggest, BUT I can’t seem to resist the urge to use more (1/4 cup+)! I keep thinking my clothes won’t come out clean enough using such a small amount. I need some help in fighting the urge to put a whole cup of laundry detergent in my washer (which isn’t an HE, btw)!!! Hi! Would love to do this but is it septic safe? I know the Oxy Clean is, but what about all these ingreds combined? I was wondering how many cups are in the grated soap? I had to resort to a different kind and it’s all natural but is already flaked. Thank you for the great idea and the pictures and information! I bought the ingredients and am going to make up some for Christmas presents. The only problem I have with this article is that it says “large” boxes instead of giving actual weights or measurements. I have no idea if the borax or the washing soda I bought is large or not because the store only carried one size of each. And I’ve never seen a box of baking soda so big that it’s almost as big as the washing soda box, as in the picture. I think there are other recipes on the internet so I think I can scope them out for the measurements. Can this be used in HE washers? Is this septic tank safe? I sure don’t need another bill! Let me know. Thanks! can this homemade laundry soap be used in a front loader? I have always used Arm & Hammer products they are amazing i love your ideas will try them. Can this be used for washing baby clothes? Thanks for this recipe – I’ve made it a few times now – going on two years of thrifty laundry! The big problem I’ve had is the non-dissolving of Fels Naptha in cold water, even when it’s thoroughly beaten by the food processor. I’ve read that it depends on how hard or soft your water is. The solution is to ‘bloom’ the soap in the microwave. My laundry-room microwave is 800W and it takes 3:30 to get to the center. From there, break up the soap foam and toss it in the blender. Process until it doesn’t get any smaller. This will make a fine powder that dissolves easily (about 3.5 c from 3 bars). Does this contain fabric softener ingredients in it? So do you use the WHOLE boxes of Borax, Washing Soda, and Baking Soda with the 3 bars of Fels Naptha grated?? What about a scent what could you use if you wanted It to smell pretty? Can you add essential oils to this for Added scents? Would this be harmful if I used this with bleach or vinegar? I always put vinegar in my rinse cycle in place of fabric softener (except when I use bleach). I use bleach when I wash my towels and dish rags. Thanks! I love there homemade detergents! I have tried many recipes. I make them as gifts for family and friends. I have made liquid and powdered detergents. They all work great. One slight modification, purchase quality detergents on sale and add to your own for a better smell and a cleaner machine! Something always gunks up the top of the machine if I do not do this. How many ounces are the bars of soap that you use? I’m excited to try this recipe! I’m amazed that it makes 208 loads! Thanks for sharing! 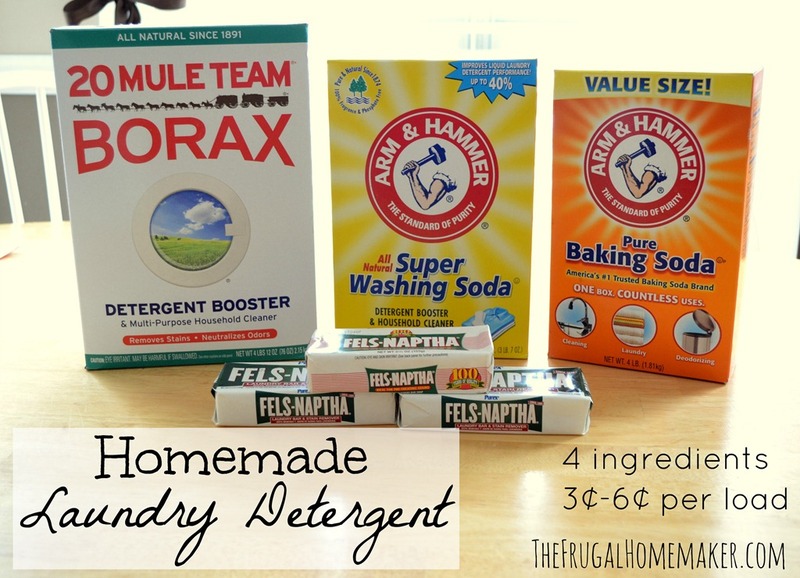 So my hubby doesnt like the smells of fels-naptha… How might i add some different scents? I to have been using this same recipe for 4 months now and absolutely love it. I do add white vinegar on my fabric softener compartment for added softness and freshness about 1 – 2 TB. Don’t worry your clothes don’t come out smelling like vinegar, between the laundry soap and vinegar our clothes smell like they do brand new. Our towels also last longer then 1 day without getting sour smelling after use. I am a believer in this and love the money saved, no more buying laundry soap, fabric softener, dryer sheets ( I use wool balls) or anything else. Using homemade natural ingredients for any cleaning purposes it can be an awesome way to keep your clothes clean and your family free from germs and harsh chemicals. There are many reasons to make this laundry detergent, but here are some benefits of using natural laundry detergent. I priced it out online and getting it all at Walmart will cost nearly $20. Not sure when you wrote this post but there is a big difference in prices. Definitely going to try this when I need detergent next. Thank you! I found Zote laundry flakes bars at Walmart. Is that the same as feels-naphtha? I have a new washer and it has a sensing before it does anything to sense how much clothes are in the washer. My question is.. there isnt a way of adding the detergent and water before the clothes are added. Will it still work if it was put in the compartment where laundry soap goes? Or do i just add it on top of the clothes? Really wanna try the diy but uncertain about that part. I remember my mom grating fels-naptha soap into her wringer washer when I was a child. It was especially for the load of whites which never got mixed with any colors. She had the whitest whites hanging on her clothes lines, back in the day.